If you aren’t ready for 4K TVs yet, you could wait a few more years for the next big thing—8K. Rave comments were heard in front of Sharp’s latest prototype 8K display at the Ceatec electronics expo outside Tokyo this week as the company tries to spark interest in the next level of dazzling displays. The enormous 85-inch LCD display has a resolution of 7,680 by 4,320 pixels, which is 16 times that of standard HD TVs, and a frame frequency of 120 Hz. The screen was showing eye-popping images of Dubai’s Burj Khalifa. Even close up, its tiny individual pixels were very hard to see. While Sharp has been working on 8K prototypes for years, it said its latest is the first to meet the so-called “BT.2020” standard for 8K resolution and color gamut set by the International Telecommunications Union, which was approved in June. 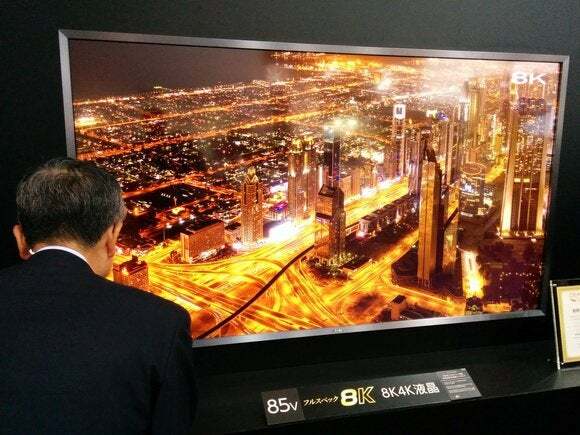 “Certainly, the bigger the screen gets, people would like to have high-resolution pictures,” Sharp spokeswoman Miyuki Nakayama said about the 8K prototype, noting the company has no plans for commercialization yet and the display is still in development. Japan is firmly behind 8K. Sharp’s prototype netted an award from the Ministry of Internal Affairs and Communications, which is promoting the standard along with public broadcaster NHK. “In 2020, we will be hosting the Tokyo Olympics, so we need to prepare the environment so audiences can watch 4K or 8K broadcasts,” said Takahiro Izumoto of NHK’s Engineering Administration Department. “Of course the hardware side must catch up with all the broadcast and infrastructure,” Sharp’s Nakayama said.